Devolro — more than external tuning. Expedition was designed so you could drive 4x4 pickup in tough conditions. Tundra, desert, prairies — all the routes are opened for you. Due to suspension lift and modification with coilovers the truck will conquer any obstacles. The installed set of powerful headlights allows you to continue driving at any time of day and night. Start your worldwide tour with Devolro Expedition. Business-class comfort, up-to-date modern equipment and all the SUV functions will make your trip reliable and ultimately convenient. King David combines the off-road pickup power, armored confidence and a calm superiority sense. Majesty and grace are balanced with reliability and strength in this model. Armored body protection will provide maximum personal and corporate security. Equipped in accordance to American standards, the vehicle can withstand a rifle shot from a distance of 10 m.
The installed electronics, onboard computer and the engine control module is checked by our specialists. Seats are upholstered with Italian luxury leather. All the work is done manually by Devolro company masters. 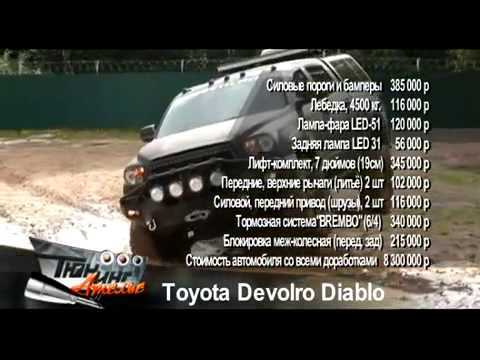 Most of the basis car details – Toyota Tundra – have been modified. This is Devolro – a powerful pickup that protects its owner in any situation. Devolro worked out a number of proposals by accenting vehicle properties in different ways. Interceptor is a perfect choice if you consider transport safety as the first priority. This off-road truck is protected from every side. Composite roof armor meets NIJ 3A standards and even exceeds them. The fuel tank withstands the explosion of the M-67 grenade, as well as the floor armor, manufactured with use of molded composite rigid ballistic anti-fragmentation materials. Run-flat tires allows to drive 50-100 Km after puncture or whole tire damage like a fire shot. The bumper provides security and power on your side in an intentional or accidental collision. There is nothing to be afraid of with Devolro Interceptor! Challenger is a representative SUV for the one who rules his life. Challenger will pass through deep snow and mud. Advanced suspension and powerful engine guarantee movement freedom on any terrain. The steel exterior distinguishes this offroad truck among other pickups around. Satellite phone, advanced GPS, computer workstation enable you to connect with the outer world from the most remote points. This makes the car a reliable work assistant, excluding any communication problems. With Devolro, you will easily face any call! Ready for the competitions. Ready for the fight. Ready for the victory! Warrior is our favorite. We install the most advanced technologies we found in the market in it. Reinforced suspension and 5.7-liter V8 supercharged engine open deserts, glaciers and mountain trails for free travelling. Original body parts are manufactured on the company territory. The last generation equipment and the efforts of Devolro engineers did their job — this pickup easily conquered all the stages of Dakar Rally Raid. High-performance Warrior always achieves the set goal. An off-road truck for professional outdoorsmen who are keen on hunting, fishing and conquering hard-to-reach places from their birth. Choose the route made up by yourself — nothing will stop you. Reinforced sway bars and 35-inch wheels guarantee the reliability of the journey. Orient on the terrain with the help of a satellite navigation system. Vision-X LED Lights will dispel fog, engine waterproof system will save the gear from moisture and dampness. Your professional equipment and inventory will remain intact — there is a rifle compartment for safe transportation in the pickup. Pursue your prey to the end! Limo is universal. In the same car you will go to a distant workplace at morning, have a dinner in the city by day and travel to the nature in the evening. This model unites the best from an off-road truck and a limousine. Protective coatings of stainless steel will keep the engine safe for a long time. Upper control arms are designed by Devolro engineers specially for this model. The Brembo brake system provides increased reliability when driving. Climate control, lighting and other settings are tuned by the control panel in the salon. Limo is isolated from vibrations and external noise. Thermal insulation protects you from heat or cold. And 520 horsepower will take you anywhere in the world. An elite vehicle can be powerful. Proved by Devolro. Pickup that everybody wants. The most popular american truck. Custom Ford with brutal appearance and manly character. 7 inch original Devolro suspension lift kit raises the vehicle height. Line-X polymer whole body coating excludes chips and scratches. The pickup is prepared for the offroad dangers — underbody is protected by skid plate. Heat and sound isolation will relieve you from climate and outer noise discomfort. Due to air intake snorkel, this F150 confidently goes through terrain even by waist-deep water. The vehicle is impervious as long as you want. With 800 HP you are able to face the challenge on any road. And the offroad is where you totally rule. Additional valuable prizes are waiting for those who upload the best selfie with our brand mark to any social media. 𝗗𝗲𝘀𝗶𝗴𝗻 & 𝗣𝗲𝗿𝗳𝗼𝗿𝗺𝗮𝗻𝗰𝗲 𝗦𝘁𝘂𝗱𝗶𝗼 Dev-X Protection Luxury Upholstery Body Ki..
We have created a number of proposals that will suit even selective enthusiasts. We offer a complete list of customizable options from more than 120 trading units, from internal to external design. Are you looking for maximum in personal and corporate security? Your quest is over, because with Devolro you get an ultimate bulletproof protection for your colleagues and employees. We are installing the best hybrid hybrid armor system on the market, which exceeds the B6 standards. At the same time, it is ultra-light (30 kg lighter) and does not affect the power and speed of the car.